A hat-trick from Liverpool striker Rhian Brewster sent England into the FIFA U-17 World Cup final with a 3-1 win over Brazil. Steve Cooper’s side weathered Kolkata’s 29C heat and humidity, along with sustained pressure from their South American rivals, to book their place in Saturday’s final. 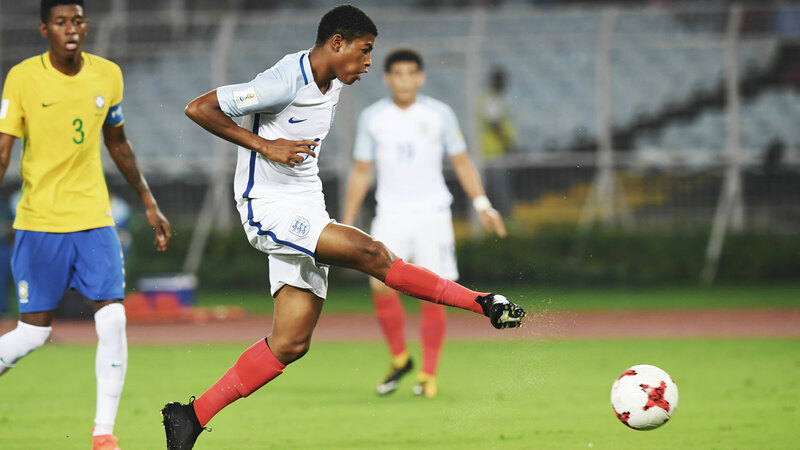 Brewster took his chances clinically and was assisted by the impressive Manchester City midfielder Phil Foden as the Young Lions look to follow the U20s, who won their World Cup in June. England will face Spain in Saturday’s final. It took only 10 minutes for Brewster to get his first, latching onto an inch-perfect delivery from Chelsea’s 16-year-old midfielder Callum Hudson-Odoi and finishing at the second attempt. Flamengo defender Wesley capped a dominant response from Brazil with the equaliser after 21 minutes, and striker Brenner rolled a golden opportunity to put them ahead wide 15 minutes before the break. But Brewster’s second, taking him top of the tournament’s goalscoring chart, sent England into half-time 2-1 up. The 17-year-old completed his hat-trick on 76 minutes after a pin-point low cross from Foden and England kept their cool to withstand Brazil’s late rally. A hat-trick against the USA in the quarter-final followed by another in Wednesday’s semi-final, made the 17-year-old the competition’s top scorer. His prolific form follows in the footsteps of Kelechi Iheanacho, now at Leicester City, who won player of the tournament at the 2013 U17s World Cup and narrowly missed out on the golden boot. Iheanacho joined the Foxes from Manchester City for £25m this summer, but Liverpool will be unlikely to entertain the prospect of Brewster going anywhere – except Jurgen Klopp’s first-team. After being promoted from Liverpool’s under-18s into the under-23s this season, the Londoner – who joined from Chelsea aged 15 – scored a hat-trick for the Reds’ first team in a behind-closed-doors friendly against Accrington Stanley. He also scored and made two assists for their under-23s against Leicester before earning his England call-up. Klopp called the teenager a “natural striker” and few will disagree after his exploits in India. Brewster will rightly grab the headlines with his second successive hat-trick, but it was Manchester City winger Foden who shone in the semi-final. The 17-year-old already has an admirer in City boss Pep Guardiola, with the Spaniard calling Foden a “gift” after he impressed on the club’s pre-season tour to the USA. Meanwhile, Mali’s bid to reach a second straight Under-17 World Cup final ended in Mumbai when they were beaten 3-1 by Spain, who will meet England in Saturday’s final. The European side led 2-0 at half-time thanks to a penalty and a slide-rule finish from captain Abel Ruiz. Mali rallied, but Cheick Doucoure’s fine strike was not given even though replays showed it had crossed the line. Moments later, Ferran Torres headed Spain further ahead before Lassana N’Diaye grabbed a late consolation. The goal was his fifth of the tournament for the African champions. Runners-up in 2015 to eventual champions Nigeria, Mali will now play Brazil in a third-place play-off in Kolkata on Saturday.